It takes a village to make a play happen. Though the actors are the face of the operation, there is a body of artists making our work at Dallas Children’s Theater possible. From artists in charge of lighting the stage to those responsible for every moment of sounds, to those actually constructing the set, there are dozens of people thinking through every single detail to ensure your experience as an audience member is nothing less than extraordinary. DCT Technical Director Josh Smith took time out of his busy schedule to talk about the process of assembling the touring set of HOW I BECAME A PIRATE. The show literally traveled to 60 cities and performed for 113,791 audience members before returning to Dallas for a four-week run on the DCT mainstage this June. 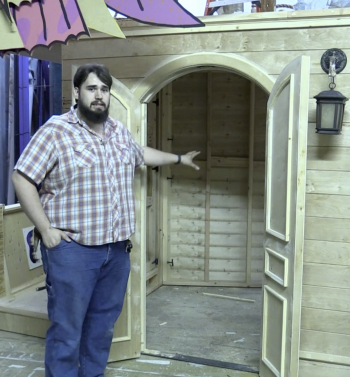 Over the course of our interview, Josh let us in on the steps involved in building a set, the challenges of creating a transportable pirate ship, and how young people can work towards a career in technical theater. What did you do when you first started out there? What were your jobs? I did some set construction. As I got good at it, they had me do more and more set construction, but I was in a theater program where there were never enough guys, so I always ended up on stage. Even though I never auditioned for anything, I’d be cast. And I’d say, “Just let me run sound or lights or the flyline,” but I was always on stage. What’s the first step in getting ready to design a set, and what was your experience like getting ready for PIRATE? When you’re designing a set, the first step is obviously reading the script. You read the script; you do research on the subject – for this case, our designer did research on pirates and studied the [How I Became a Pirate] books. My job comes in usually after the designers come up with their design and talk to the director to make sure they’re on the same page. I get to see the plan and the drawings, and then I have to figure out how to build what they want, even if it defies physics. We have to make sure we’re in budget and on time, so there are a lot of steps involved, and one of the biggest things is making sure the actors are safe. How did knowing that your set would have to be boxed up after each performance to tour the country affect your process? One of the big things about tours is you can’t build a big, heavy, unit set. Everything has to fit into a box truck, so everything needs to break apart, be as light as possible, and be as durable as possible because it’s going to get thrown around and slammed around. It’s a big challenge balancing all that while also making a set that can be put together within a two-hour time span. For the touring group to build it, the set has to be light enough to allow them to move everything. What was your work schedule for building this set, and what was the team process? Here, we try really hard to keep a 9 to 5 schedule as much as possible and not work on weekends during the building stage, so a lot of it comes down to planning ahead of time, knowing your crew and what their strengths are – making sure people who are good at welding do welding; people who are good at finish work do finish work; and people that are good at artsy, decorative stuff do artsy, decorative stuff. What do you enjoy about your job, and what’s difficult about it? I really enjoy the challenges. No two sets are the same. You have curved stair railings; you have crow’s nests that have to be supported with minimal amount of structure showing. There are always different and interesting challenges. That’s my favorite part of the job, but that can also be the most stressful part of the job because you can do anything with the right amount of money and time. In theater, though, those are two things that you usually don’t have a whole lot of. What advice do you have for kids who are interested in technical theater and design? Just jump in there and do it. Don’t be afraid to make a mistake. A mistake is a good thing to make as long as you learn from it. If you really care about it, go out there, read books on it, do research, and get involved in internship programs. The more people you work with, the more different experiences you have and the better you’re going to be. 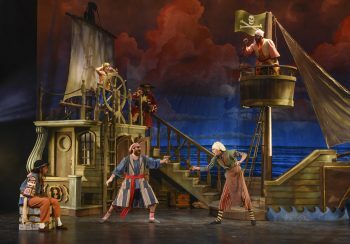 HOW I BECAME A PIRATE runs June 15th through July 8th at DCT. For tickets and more info, visit dct.org. 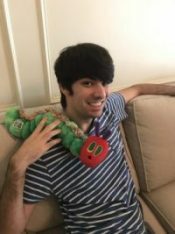 Ryan Diller is a DCT Guest Writer, pictured here with one of his favorite childhood memories. He is the former Web Editor of 1966: A JOURNAL OF CREATIVE NONFICTION, and his writing has appeared in MULTIBRIEFS and HOT PRESS. 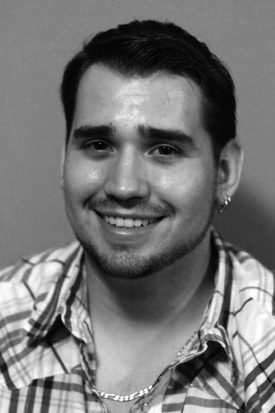 He is currently working towards an MFA in Playwriting at the University of Calgary.